Last June my wife and I and our two teenage kids were in Southern California on a week long family vacation. The first night were in Hollywood before heading down to Orange County. After dinner our first night, I took a few minutes to explore a bit of Hollywood Boulevard. Here's a link to Part I and Part II. Above, the Hollywood Walk of Fame in front of the (1927) Outpost Building, a retail and office building. 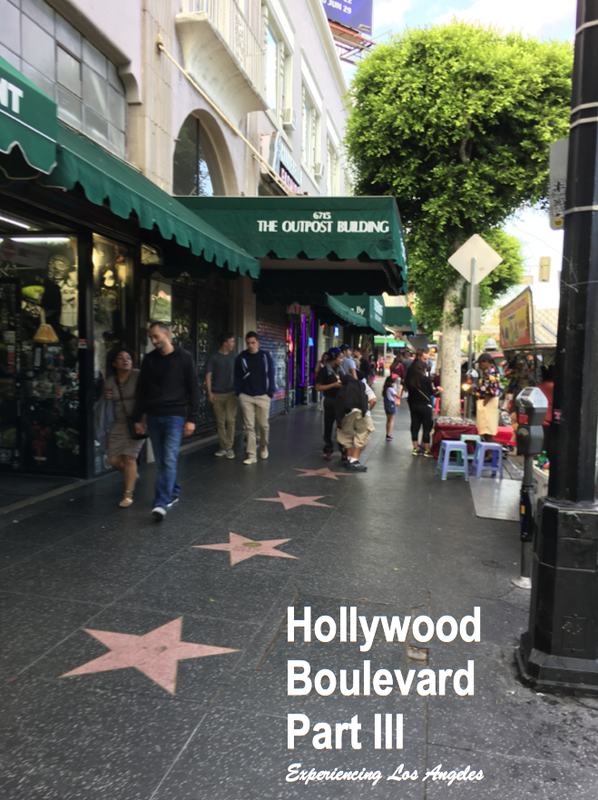 Last week, I highlighted some of the grittier aspects of Hollywood Boulevard, especially the stretch of east of Highland Avenue. 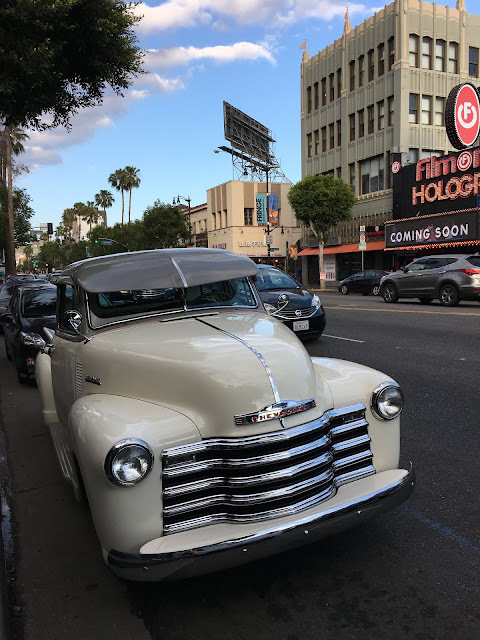 In contrast, the area immediately west of Highland Avenue, featuring the Hollywood & Highland commercial development an adjacent Grauman's Chinese Theatre, has seen a lot of improvement over the years. Here's a link to a post highlighting the area around Grauman's Chinese. And there were certainly bright spots east of Highland - where I was walking. Above, Chateau Demin at 6753 Hollywood Boulevard. There also seemed to be an over abundance of souvenir shops. 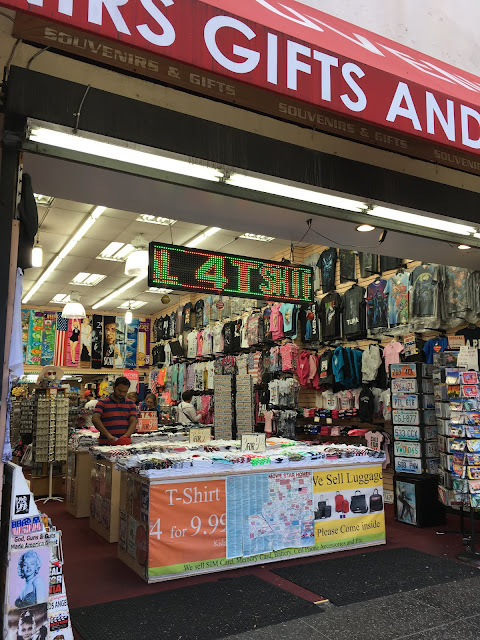 Although I will admit that "4 T-shirts for $9.99" is a great deal. Another souvenir shop, more T-shirts. More of the same. I guess 4 T-Shirts for $9.99 is the going rate. 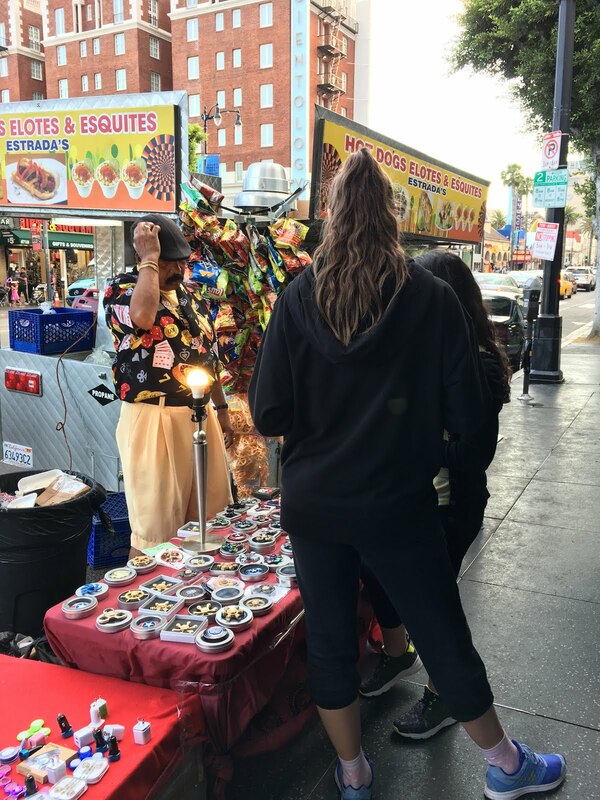 And more street vendors. This guy seems a whole lot more organized, and a bit more legit, that the folks I saw earlier. 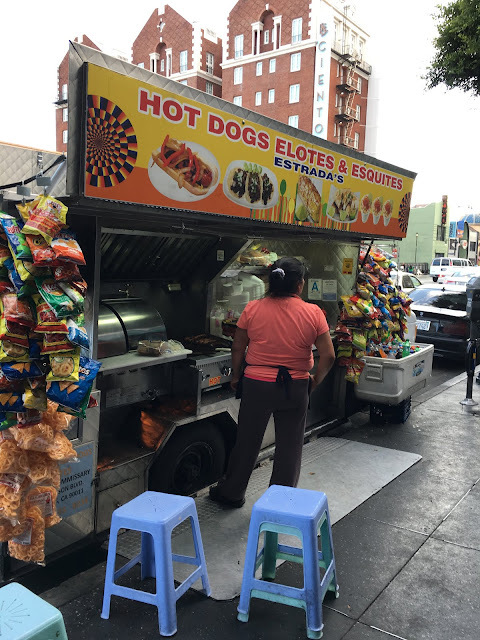 And a sidewalk food vendor. Estrada's has an "A" rating. I already had dinner. I passed by the Musso & Frank Grill. Musso & Frank has been proudly serving Hollywood since 1919. My wife and I enjoyed lunch here a few years back. Here's a video link to the late Huell Howser, stopping by Musso & Frank in this 1995 flashback episode. Classic Chevrolet parked out front. Any guess what year this car is? Leave a comment below. 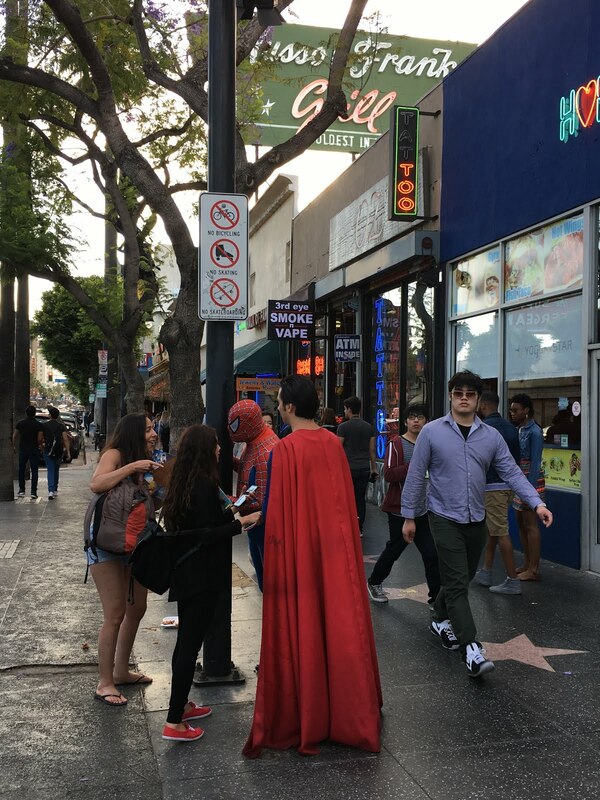 It wouldn't be Hollywood or Hollywood Boulevard with a visit from Superman or Spiderman. Would be actors often will pose as movie celebrities or characters (including a Michael Jackson impersonator, Darth Vader, Batman, Joker, Iron Man, and really bad versions of Mickey and Minnie Mouse). These characters WILL expect tips and apparently (especially those camped out in front of Grauman's Chinese Theatre) some can get fairly aggressive. A pic with a character could be fun - just make you ask what their "standard rate" for a tip is first. Another view of Musso and Frank. Here's their website. I walked as far as the (1926) Baine Building, on the corner of Hollywood Boulevard and Whitley Avenue. 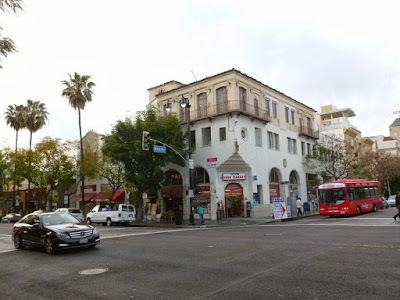 The building was built by Col. Harry M. Baine, a prominent businessman and Hollywood booster who became a Los Angeles County Supervisor a few years after this building opened. I cheated a bit: the above photo was from a previous post. What makes this building interesting (to me, at least) is that the Baine Building is the inspiration for a similar building at the Disney Studios theme park at Disney World in Orlando and the Disney California Adventure theme park in Anaheim. Across the street, another look at the (1928) J.J. Newberry Building on the left and the (1935) Kress Building on the right. This is just down the street from the Hollywood Motel Six, where we were staying. Heading up Whitley Avenue. Pictured is the (1928) Fontenoy, a historic 13 story apartment building. 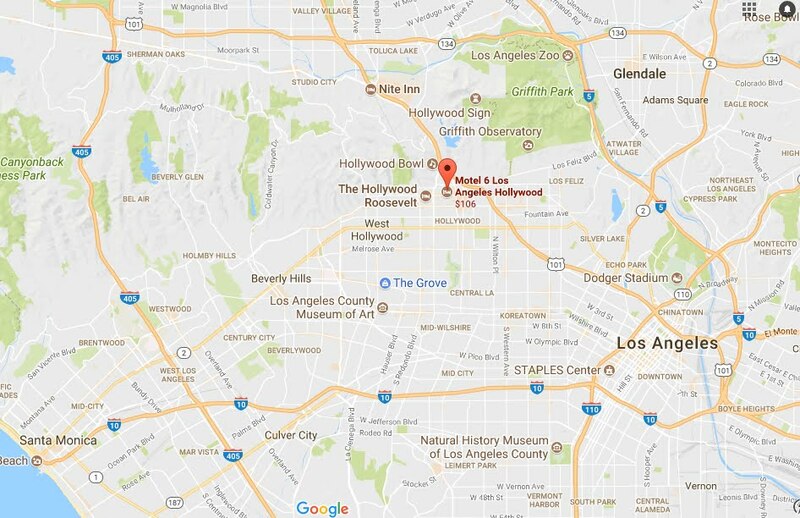 According to a Google review, this is where Johnny Depp lived when he first moved to Los Angeles. And the Hollywood Motel Six - where where we were staying. Next stop that evening - the Griffith Observatory. More on that next time.